"Ruffled" A semipalmated sandpiper looking disheveled after shaking out its plumage. It's mottled appearance of light grey and darker feathers, plus pointy feathers without buffy edges indicates that this individual is an adult (AHY) bird and not a young bird from this year. The wear on the old plumage and molt makes the adults look distinctly shabby compared to the new, bright, rounded, and neatly bordered plumage of young birds. Canon 7D, Sigma 70-300mm f/4.5-5.6 DG APO lens, ISO 400, f/8, 1/1250 sec. No, not the marshmallow ones, that's a blog entry for another time. 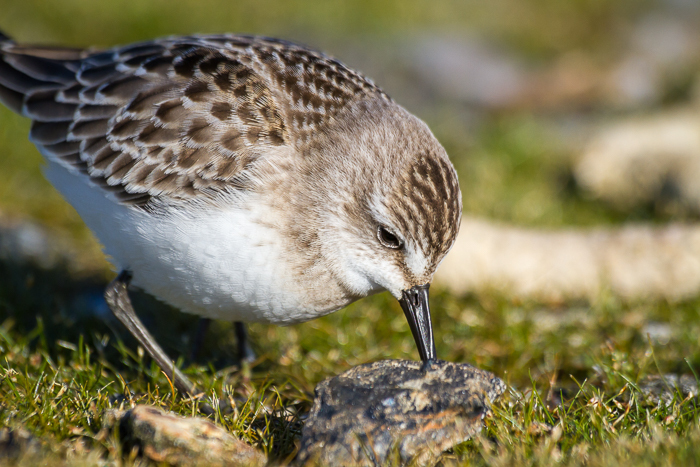 This post focuses on the biology and behavior of the small Calidris sandpipers (collectively known as "peeps") and how best to observe them. This post and the accompanying images were inspired by a recent field trip I led to Jamaica Bay Wildlife Refuge in Queens, NY with some great folks from the Color Camera Club of Westchester. "Quiet Moment" Compare this juvenile (HY) semipalmated sandpiper to the adult pictured above. Notice that there are no obvious molt patterns with distinctly darker fresh feathers next to faded older ones. Notice that each feather on the back is nicely rounded instead of pointed and worn to the shaft on the tips. Also notice that each feather is clearly edged in buff or white. Overall the appearance is crisp, clean, and scaly. If you zoom in, in this image you can also see the fine serrations on the inside of the slightly open bill. Canon 7D, Sigma 70-300mm f/4.5-5.6 DG APO lens, ISO 400, f/8, 1/1250 sec. 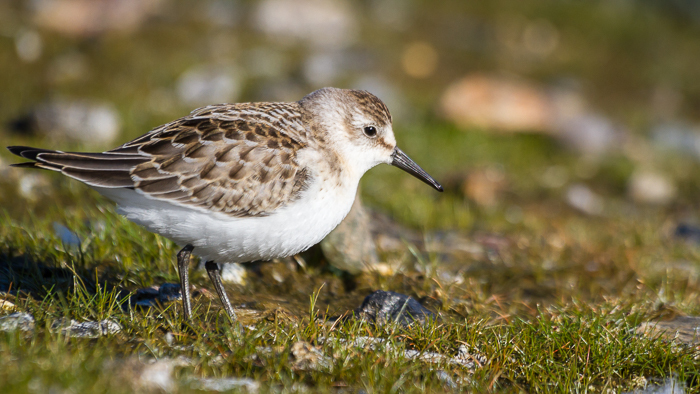 These techniques also work for many other species of shorebirds as well. First, take in the overall appearance. 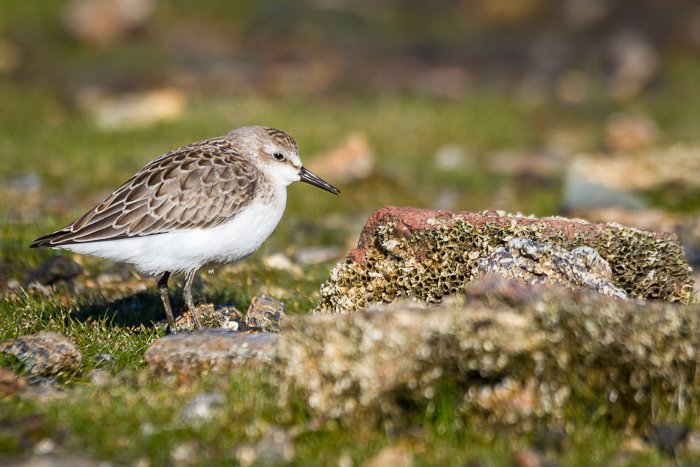 Juvenile shorebirds in the fall look clean, crisp, generally more colorful, and almost "scaly" in appearance. Adults tend to look slightly shabby, faded, and lack the "scaly" appearance. Next look for molt patterns. On a juvenile feathers will vary with the plumage pattern, but feathers in the same area/set will look roughly the same in color, tone, and brightness. In adult birds you will see feathers that are obviously newer (different, often darker or lighter color and less worn), next to older ones. Then look at the feathers themselves, are they rounded and fresh looking (juvenile, hatch year or HY bird), or distinctly pointed and often worn down to the shaft at the tip (adult, after hatch year, or AHY). Finally are the outer edges of the feathers outlined with a pale buff or white, giving the above mentioned "scaly" appearance on the back? This is an indication of a juvenile bird. In adult feathers this time of year, most of this edging has worn off or is absent. "Consistency And Variation" Despite overall consistency in size, plumage pattern, and bill compared to the differences between peep species, there can be quite a bit of variation in semipalmated sandpipers (Calidris pusilla) in color, bill length, and body size. Notice in these two juvenile (HY) individuals that the bird on the right is darker, more brownish, and has a bit more rufous in the edges of the upper scapular feathers. Birds can vary between grayish, golden, to dark brown. Bill lengths and the amount of slight droop at the tip can also vary between individuals. This variation can sometimes be a source of confusion with distinguishing from other peeps such as western sandpiper (Calidris mauri). Canon 7D, Sigma 70-300mm f/4.5-5.6 DG APO lens, ISO 400, f/8, 1/1250 sec. Depending on the habitat and timing, but certainly the case at Jamaica Bay Wildlife Refuge in NY where these images were taken, semipalmated sandpipers (Calidris pusilla) will probably be the most abundant peep species during migration in many east coast locations. Often birders have a difficult time picking out other peep species; and when you are dealing with flocks of hundreds of constantly shifting birds, it can definitely be a challenge. Here are a few tips for picking out other species among the numerous "semis". "Shake It Off" A white-rumped sandpiper (Calidris fuscicollis) shakes water off its body after bathing. In the field, this peep is noticeably larger than the other three common peeps in this habitat. Also note the elongated appearance and when folded the wing tips will extend beyond the tail. The distinct white supercilium is also a good field mark. When visible, the orange/red base of the lower mandible and the completely white rump (visible when flying or preening/bathing) are diagnostic. For a challenge, can you age this bird using the skills you learned above? Canon 7D, Sigma 70-300mm f/4.5-5.6 DG APO lens, ISO 400, f/8, 1/1250 sec. Overall shape and size can be good indicators that something is worth a closer look. Western sandpipers (Calidris mauri) average slightly larger, chunkier, and front heavy than semipalmated, while least sandpipers (Calidris minutilla) average slightly smaller and lighter. White-rumped sandpipers (Calidris fuscicollis) are quite noticeably larger than all these peeps and the wings extend beyond the tail giving the bird a distinct sleek, elongated look when compared to other nearby peeps. 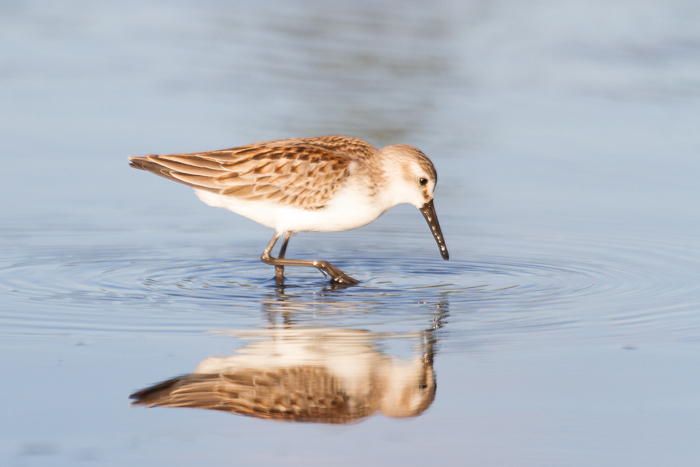 "Pale Reflection" A western sandpiper (Calidris mauri) forages in the shallows. Notice the overall paler, grayer appearance and front heavy bearing. Also the bright rufous edged upper scapulars (particularly contrasting with the overall paler appearance) are a strong indicator of a western. Finally, notice the the longer bill with a noticeable droop near the tip. Full disclosure, this image was made in September of 2014 at Jamaica Bay, as I didn't capture any images of western sandpipers on my most recent trip. Canon 7D, Sigma 70-300mm f/4.5-5.6 DG APO lens, ISO 400, f/5.6, 1/1000 sec. Overall color can be another great indicator. 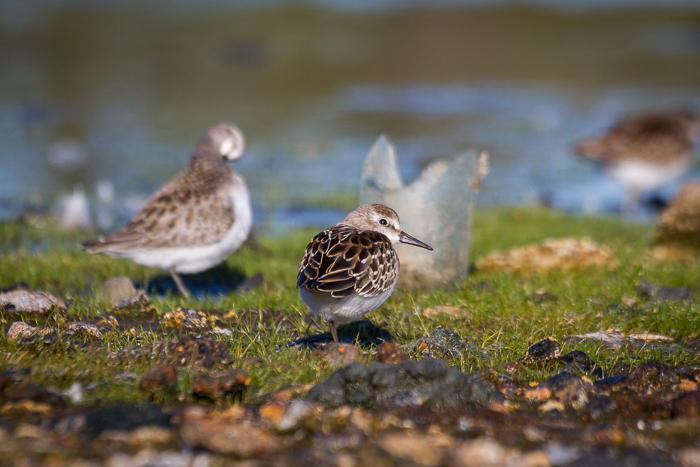 Western sandpipers tend to molt earlier than other peeps and by September are often in much paler, grayer non-breeding plumage. Also the bright rufous edges to the upper scapulars frequently stand out as a distinct color patch. 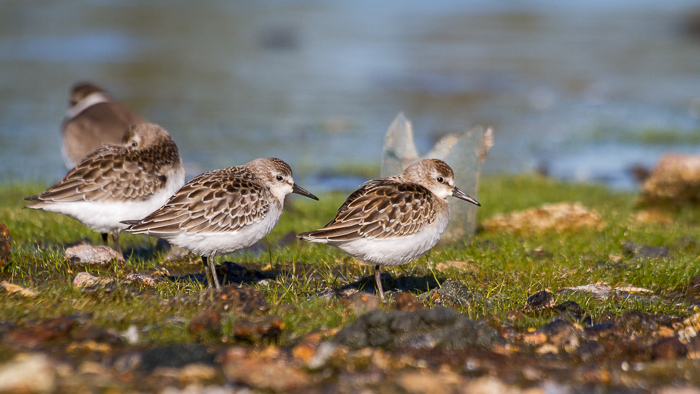 Least sandpipers tend to be a much richer, and in juveniles more overall rufous, brown than the other peeps. 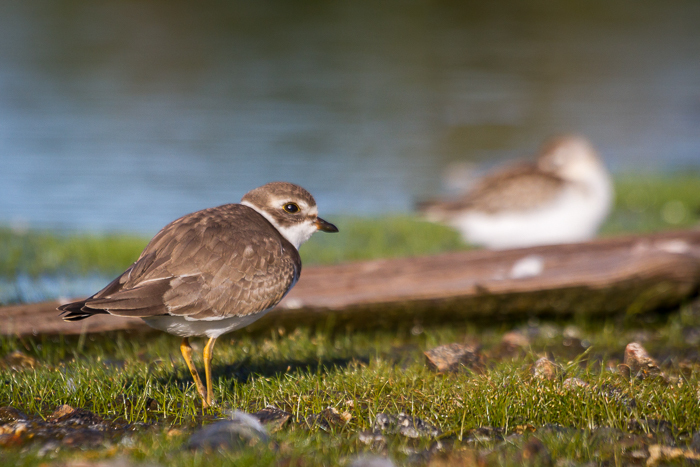 An additional diagnostic color cue is that least sandpipers are the only peeps with yellow legs (but be careful of mud encrusted legs). "Least, But Not Last" The least sandpiper (Calidris minutilla) is our smallest common peep. Note the deeper brown color with more rufous, the thin drooped bill, and diagnostic yellow legs. Canon 7D, Sigma 70-300mm f/4.5-5.6 DG APO lens, ISO 400, f/8, 1/1250 sec. Finally, pay attention to bill size and shape. This can be fairly variable in semipalmated and there is some overlap with western, but taken in conjunction with other features, this characteristic can be important for positive ID. 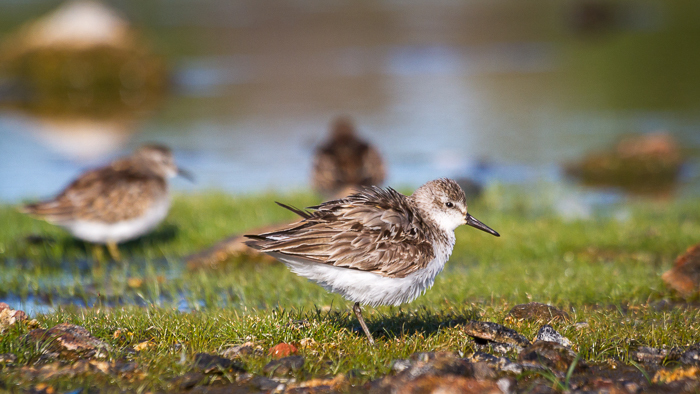 Western sandpipers have generally longer bills that are more tapered and drooped at the tip. Semipalmated bills tend to be shorter, straighter, and more blunt in comparison. 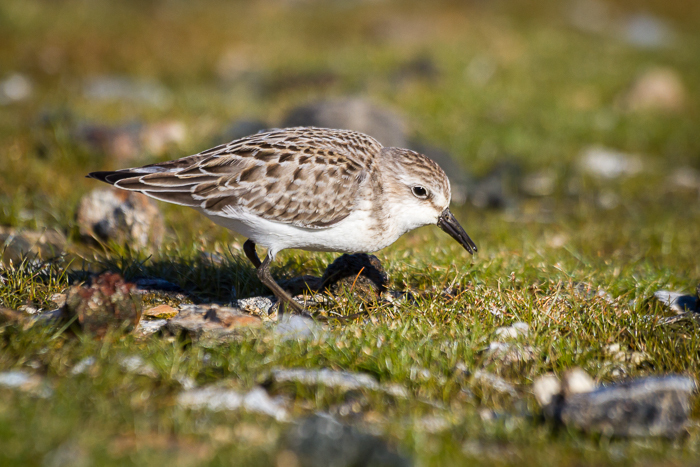 Least sandpiper has a thinner, more tapered bill, with a very distinct, but small, overall droop. 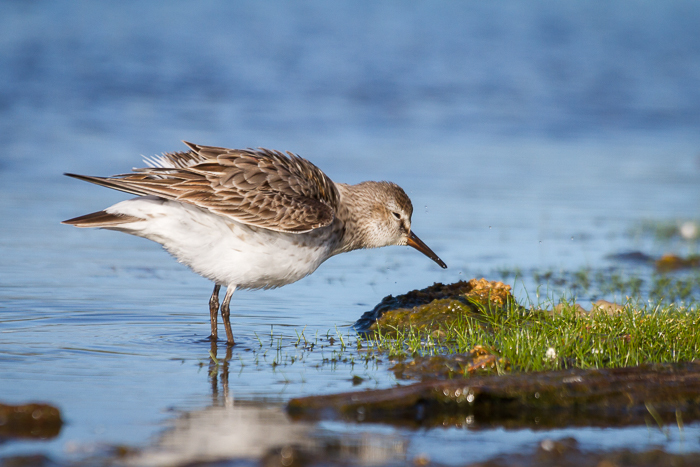 White-rumped sandpipers have a wide base that tapers significantly towards the tip, also with a distinct droop. 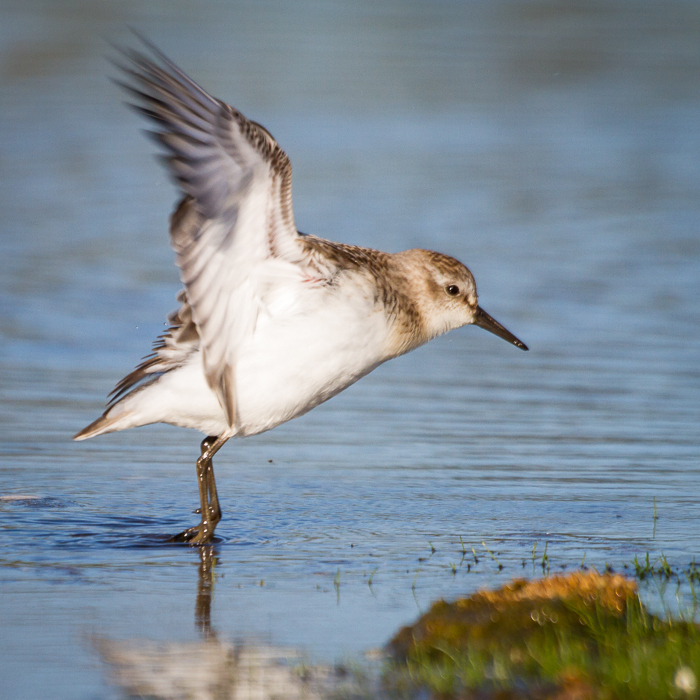 "Step Lively" A juvenile semipalmated sandpiper runs towards me during an active foraging session after landing. You can actually see the slight webbing at the base of the toes that resulted in the name "semipalmated". Canon 7D, Sigma 70-300mm f/4.5-5.6 DG APO lens, ISO 400, f/8, 1/1250 sec. Migrating in flocks, peeps make for great behavior watching. One of the main behaviors you'll notice is foraging. Take some time to watch the different species of peeps and individuals. Do certain species or individuals spend more time probing in the water or on land? Do they mostly utilize the wet mud flats near the edges of the water, or farther upland where the mud is dryer or dominated by vegetation. Do they do more gleaning or probing in the mud? 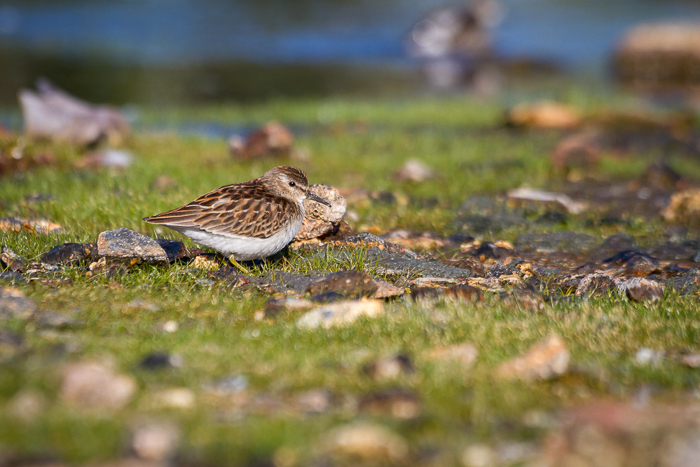 "Mouthful" A semipalmated sandpiper gobbles down a mouthful of invertebrate it gleaned from the surface of the mud and grass. Canon 7D, Sigma 70-300mm f/4.5-5.6 DG APO lens, ISO 400, f/8, 1/1250 sec. Other behaviors to look for include preening and bathing, predator detection and avoidance, as well as small scale territorial squabbles (usually over feeding space or prime resting areas). "Making Pretty" A peep preens its feathers as it rests on a small island in East Pond of Jamaica Bay Wildlife Refuge. Pop quiz: which species and what age? Canon 7D, Sigma 70-300mm f/4.5-5.6 DG APO lens, ISO 400, f/8, 1/1250 sec. And if your entire flock suddenly flushes through no action of your own or other nearby humans, keep your eyes open. "Wary Of The Skies" A juvenile semipalmated sandpiper scans the skies for aerial predators. If you watch a flock of resting peeps they will frequently make these scans for predators, particularly if the movement or shadow of a larger bird flying over makes them wary. Canon 7D, Sigma 70-300mm f/4.5-5.6 DG APO lens, ISO 400, f/8, 1/1250 sec. You might just be treated to the sight of a hunting peregrine falcon. "Liftoff!" A semipalmated sandpiper flies from the water to the shore. If your entire flock of shorebirds flushes and it wasn't something you did, keep an eye out for aerial predators like the peregrine falcon. Canon 7D, Sigma 70-300mm f/4.5-5.6 DG APO lens, ISO 400, f/8, 1/1250 sec. 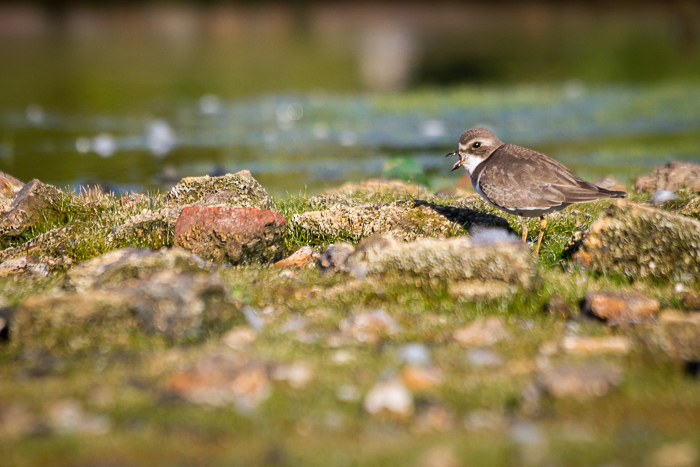 "Open Wide" Semipalmated plovers (Charadrius semipalmatus) are often found among or nearby flocks of peeps. I think this individual was yawning or stretching. Canon 7D, Sigma 70-300mm f/4.5-5.6 DG APO lens, ISO 400, f/8, 1/1250 sec. 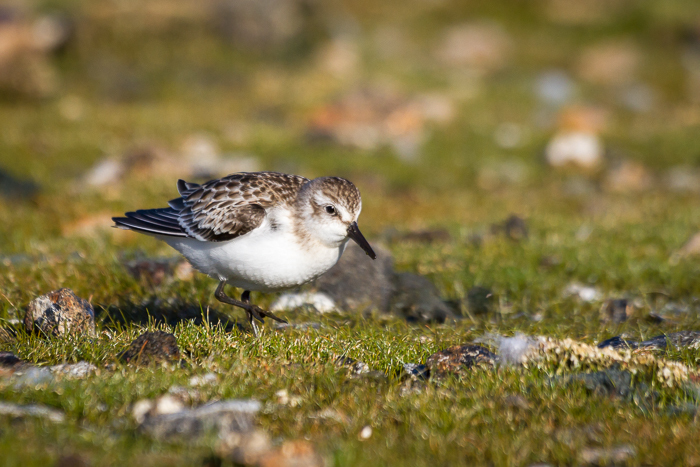 When out observing peeps, don't forget to look around for other shorebird species. 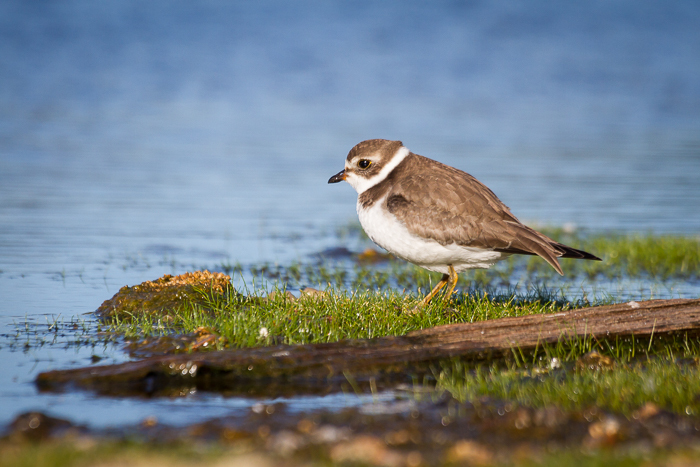 Often species like the semipalmated plover (Charadrius semipalmatus) will be mixed in with the peeps. 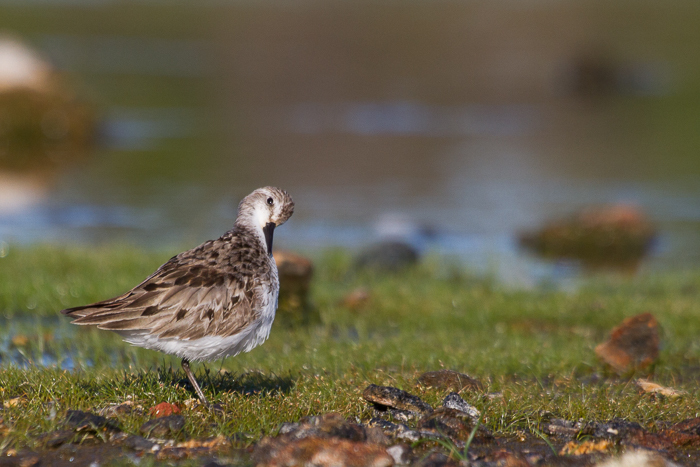 Nearby, but usually not part of the peep flock, you might see larger shorebird species like on of the yellowlegs or the stilt sandpiper (Calidris himantopus). "Eye On The Sky" Peeps are not the only ones that periodically scan for aerial predators. Canon 7D, Sigma 70-300mm f/4.5-5.6 DG APO lens, ISO 400, f/8, 1/1250 sec. One of the best ways to observe shorebirds is from a distance with a spotting scope. This is the best way to ensure that you are not unduly disturbing the birds. Even then, wearing muted natural colors that blend into the environment (not white), moving very slowly, and staying low as your body and viewing conditions will allow, will keep your actions from disturbing the birds. "Close-Up" While not my best composition, I include this image of a foraging semipalmated sandpiper to show how close birds can get if you follow the tips described here. I also like how you can really see the feather detail in this image. This bird and several others actually came even closer, but they came so close (probably within a foot) I could no longer maintain focus without reaching up and switching my lens to "macro" mode, which I didn't want to do for fear of startling them. Canon 7D, Sigma 70-300mm f/4.5-5.6 DG APO lens, ISO 400, f/8, 1/1250 sec. If you need to get closer for photography or you just want to experience the magic of feeling part of the flock and observing behavior on a personal level, then you'll need to take extra care. I need to state explicitly at this point that you should avoid flushing shorebird flocks as much as possible (sometimes trail paths or beach activity make that impractical/impossible). These birds have a limited amount of time to refuel for their long journeys south and time spent flushing back and forth is an additional expenditure of energy on top of the time lost feeding. Never chase birds back and forth, if you inadvertently flush them, back off and accept that the flock might be too sensitive to approach. It is important to note that I didn't flush any of these birds while taking these images, in fact, as I worked, additional birds joined the original flock. Eventually I was practically surrounded by birds on all sides. "Plover Portrait" This semipalmated plover spent time wandering all over the small island where I was photographing. Canon 7D, Sigma 70-300mm f/4.5-5.6 DG APO lens, ISO 400, f/8, 1/1250 sec. The best strategy is to find a place that seems to be productive and then sit and wait until the birds come to you. Either arrive before first light, or approach an area just after the birds have been flushed by a predator or other human activity. Again, while camouflage/ghillie suits are helpful, it is not necessary, but natural, muted colors are a must. Get as low as possible. In fact, your best results will be if you lay down. With the possible exception of beach goers, shorebirds are not used to seeing humans lying down and don't perceive them as a threat in that position. This has the added benefit of giving you an eye-level perspective, instead of looking down on the birds. Any movements and readjustments should be done deliberately, glacially slow. Try to avoid direct eye contact with your subject, particularly while moving, as that is perceived as more threatening. Either look through your camera or out of the sides of your eyes. "Pale Knight" A particularly pale (and longer beaked) specimen of a semipalmated sandpiper strikes a pose while foraging nearby. Canon 7D, Sigma 70-300mm f/4.5-5.6 DG APO lens, ISO 400, f/8, 1/1250 sec. If you must approach a flock, then there are several techniques that can help. Watch the birds carefully (but not directly, see above) and at the first sign of agitation, stop all movement and don't resume until the birds have gone back to normal activity. Signs of agitation can include birds becoming alert from resting postures, birds looking directly at you, birds alarm calling, birds moving away, and birds with a hunched posture indicative that they are readying to take flight. Avoid direct eye contact as you move, in fact try to look at the ground or off to the side. Move exceedingly slow with frequent pauses to give the birds a chance to adjust and to gauge their reactions. It is also often helpful to approach from an indirect route, either zig-zagging to your final destination or heading towards a goal off to the side before shifting into your final position. Stay very low. Inch on your belly if possible. If not, crawl, kneel, or hunch over. Patience is key. It may take a while for birds to fully accept your presence, but soon they might start acting as if you aren't even there or are part of the environment. With this birds will start moving towards and in front of you and you'll have unprecedented access to details of plumage and behavior. It can be a truly magical experience for those with enough patience, and the will to tolerate wet ground, insects, sun, and uncomfortable positions. 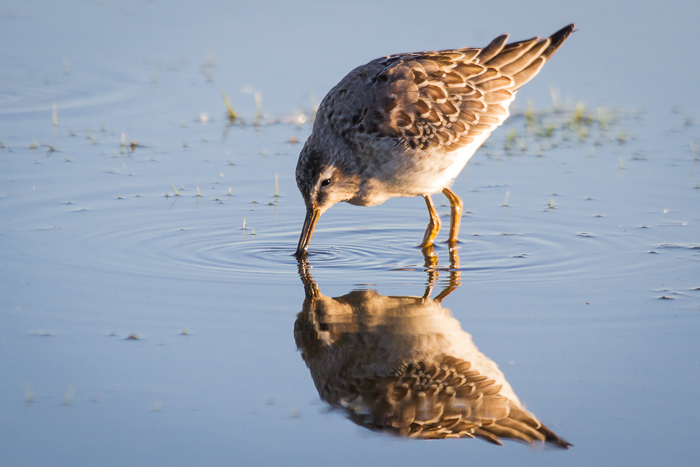 "Sunrise Reflection" I'll leave you with an image of one of the larger Calidris sandpipers, the stilt sandpiper (Calidris himantopus) which I photographed just after sunrise as we emerged out onto the first of the mud flats on East Pond. Canon 7D, Sigma 70-300mm f/4.5-5.6 DG APO lens, ISO 400, f/8, 1/320 sec. Enjoy and always keep the welfare of the birds utmost in your mind. Many thanks, Elijah, for this wealth of information on the birds of Jamaica Bay. What I find the most interesting is the way you completely immerse yourself into the surrounding environment, to the point where the birds can be observed without being aware that you are studying their behavior. You've inspired me to engage in this "contemplative photography" during my next field trip. You're pictures are breathtaking, too!